If you are looking for a gift for the man in your life, I have a wonderful gift. It is a gift with distinction. This is a wallet like no other. It is from Ekster, the makers of fine premium wallets with the technology to actually have trackers in the wallets that help keep track of them in case they are stolen. 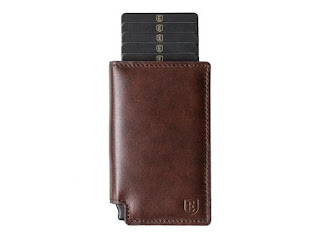 The Ekster Parliament + Tracker is a leather bi-fold smart wallet for those that want maximum storage and minimum bulk. The owner will have quick access to his cards, worldwide traceability, solar powered tracker card, RFID blocking technology and premium European leather. The wallet is 0.59 x 4.1 x 2.5 inches (1.5 x 10.5 x 6.5 cm). It stores at least 9 cards. It has RFID blocking for 4-6 cards. The cardholder holds a maximum of 6 non-embossed cards or a combination of 4-5 embossed cards. .Multi-purpose 3 folded bills cash. BLE 4.0 Bluetooth low energy. It has a range of up to 100 ft. (30 meters). It has coverage of World-wide 5M+ Crowd-GPS network. When solar charged for 3 hours the charge lasts up to 1 month. And it has a built in ringer. It comes in four shades: Classic Brown, Nappa Black, Steel Blue and Roma Cognac. The above is Classic Brown. The solar/tracking unit is used to track your wallet in case of theft. This is done using TrackR technology. By downloading the TrackR app and turning on your mobile's WiFi and Bluetooth, the user can track his waller virtually anywhere. This is possible thanks to TrackR's Crowd Locate technology, which essentially allows anybody with the TrackR app and a Bluetooth connection (when they are in proximity to the lost wallet) to upload your lost wallet's location information to the App (visible only to you) so that you may locate your lost wallet. 2-way wallet-to-phone and phone-to-wallet ringing mechanism. Used to locate your phone/wallet in case it is lost within the house or nearby in the car. 2-way proximity alert. You will be notified if your wallet exits the Bluetooth range of your phone and vice versa. This is useful in case you walk out of the house without your phone or your wallet. You will be notified to go back and pick it up. Solar powered: the tracking unit runs on light energy. On one side of the tracker, the embedded mini-solar panel can be seen. 3 hours of light charge typically charges the wallet for two months of usage. Any light source can be used to charge the device. It doesn't have to be sunlight itself. The website offers free shipping on orders over $50.00, free returns and a 12 month warranty on the wallet. There is also safe and secure checkout. Right now if you enter the code XMAS-30 you can save 30% off the price of any wallet or accessory on their site. I believe this will make a great gift for any discerning man or a man who likes to have nice things. It is definitely something I would get for a young man who is technically inclined. The price point is not too much and it has a lot of usefulness. This is more than just a plain wallet. It does more than just hold money. I know a number of men who would be interested in this kind of technology. Ekster Wallets are available online at www.ekster.com. Like Ekster on Facebook: https://www.facebook.com/eksterwallets; Follow Ekster on Twitter: @eksterwallets; Follow Ekster on Pinterest: https://nl.pinterest.com/eksterwallets/ and Follow Ekster on Instagram: https://www.instagram.com/eksterwallets/.